Like I was saying in my previous post, My Top 5 Favorite Saints, the processional song for mass last night was the Litany of the Saints. My liturgist does something interesting with the song and he starts throwing in great people who are not cannoized saints but who are probably a good bet to be in Heaven such as Dr. Martin Luther King, Mahatma Gandhi, Thomas Merton. They then start reciting all the people from the parish who have died in the last year. I have to say, I'm not sure about how theologically correct doing this is but I think it is comforting to the people who have died. I did think it would be interesting if instead of singing "pray for us" after each name, if the congregation could some how switch to singing, "pray for him." After all, we are supposed to offer up our prayers for the dead that they may more quickly make it out of purgatory and into heaven. But I suppose that might be difficult. I then thought about doing a follow up to the Top 5 Favorite Saint post for All Soul's Day and list people who I know and love who have passed and whom I would like for you to pray for. I'm worried about people being offended because their loved one did not make my list s:o I'm taking off the "Top" part of my title and just listing five people in my life who have died and had a BIG impact on my life. Why do we pray for those who died? As Catholics, we believe that when you die you are going to either Heaven or Hell. Very few of us are purified enough to make it to Heaven right away so, through the grace of God, we are allowed to go to purgatory first so that we may be made pure in order to enter Heaven. That is a very simplistic explanation but we pray for those who have died that they may leave Heaven and be in God's beatific vision. 1.) Grandpa Chub: That is what all of my other cousins called him. I just called him Grandpa. 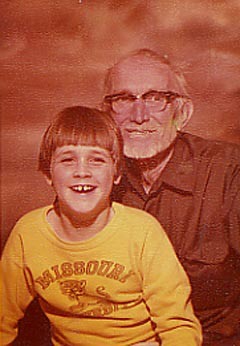 I grew up as a single child until I was 13 years old with a single mom and Grandpa was my main father figure. He was sixty by the time I was born and in his seventies by the time I was in my formative years and passed away when I was a teenager. 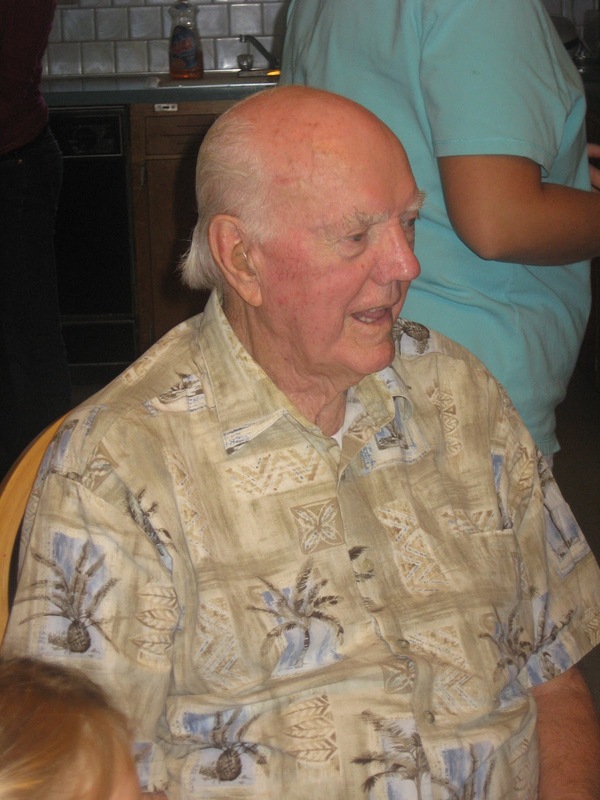 He was a printer most of his life and very involved in Cub Scouting. I took my Mic-O-Say name from him. He was "Black Parchment" and I am "Little Black Parchement." 2.) Grandma Margaret: She died years before I was born when my mom was still a young teenager. That doesn't mean she was forgotten. I've heard so many wonderful stories growing up from her kids---my mom and her brothers. She was from Shendoah, Iowa. She started dating my grandpa and converted him to Catholicism. They had six boys and one daughter. 3) Kenny Harris: He was my baby sitter's husband and coincidentally, his workshop was across the street from my house growing up so I spent a lot of time there hanging out. 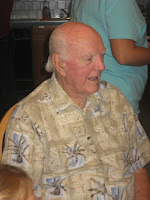 He drove grain trucks, worked on cars and helped farm. I got to do lots of cool things because of him--or at least cool for a kid growing up. Like riding in a combine during harvest or riding to Kansas City in a semi-truck. 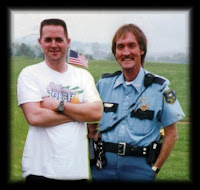 4) Uncle Mick: Mick was the Chief of Police in Tarkio, where I grew up and was one of the reasons I am the way I am. Don't hold that against him. But, I would say he is a big reason I became a cop. He was a contributor to my wit and great sense of humor and a leading cause for my fondness for the Beatles. Sadly, he passed away before his time. I was only in his mid-fifties and died from emphysema from years of smoking. I may mention---he is also a leading factor in the reason I hate cigarettes. 5) Max and Doris--my wife's grandparents. I couldn't separate them because they are, in my mind, forever combined. I never met them until I was in my 20's and dating Abby and are a model for me what a happy marriage should be. I see so much of Doris in my wife--kind, caring, stubborn and tough. Max (who we name our son after) was one of the most kind and gentle people I have ever known. I pray that Abby and I are as happy as they were. So there they are. Hopefully they are already in Heaven. To hear my uncles talk, my grandmother was probably a straight shot for Heaven and probably some of the others. But, pray for them anyway please.